Larry's books are now available to order from our web site. In 240 pages, Larry provides the insights and tools you need to bring out the best in your team. You'll learn how to inspire team members to maximize their contributions and secure their enthusiastic commitment so results exceed your highest expectations. Larry Dennis has trained more than 4,000 business leaders in the United States and Canada and is the author of ten books, including Repeat Business and The Language of Leadership. In this book, he shares well-tested principles for creating engagement along with helpful examples from many of his Leadership Development Lab participants. If you want to fully engage your team, this is the book for you. 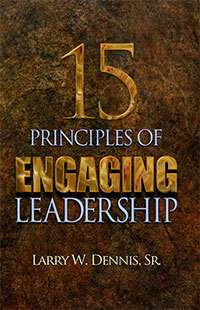 "These 15 Principles of Engaging Leadership should be engraved on ever desk in America. Once you read them and understand them, you will have a real framework to deal with problems as they arrive in your business life. Read this book again and again. During each reading you will discover a new gem of wisdom." Treasurer, DSU Peterbilt & GMC Inc.
"Larry Dennis continues to inspire and improve lives on so many different levels. With the release of 15 Principles of Engaging Leadership, Larry shares essential tools to help build a team that leads with elevated standards. Our company has over 120 graduates from the Turbo Leadership Development Lab, and the lessons in this book have helped our team win work, make friends, and build our future." "The 15 Principles of Engaging Leadership are timeless and timely. Larry, a lifetime friend who embodies these principles, has explained them well, with stories and examples that make them easy to apply in daily leadership practices. Larry's ideas work because they are practical, and the book, just like the author, is inspiring." President, Ralph Nichols Group, Inc.
"Leadership is not a skill anyone is born with. Some people may have personality traits that may make them feel like a "natural born leader" but in my 35 plus years of holding leadership positions, from a line supervisor to CEO, I've found that everyone needs a playbook to learn how to become effective leaders. I've benefited greatly by learning and then living these 15 principles in my professional and personal life. The action I call you to is do the same. The benefit you will gain is life changing." "In this book, Larry revives the core principles of leadership with an engaging blend of relevant stories and practical tactics for success. This work should be on the top of every leader's list for both daily motivation and managerial guidance." "There's something different about Larry's 15 Principles of Engaging Leadership. I've read many books and attended countless industry management seminars over the past 30 years. The challenge for me is seeing clearly how to apply the ideas to our unique business. Larry's writings and real life examples help me see how to apply timeless leadership principles and provide the inspiration and motivation to go into action. I encourage you to start reading your copy today." 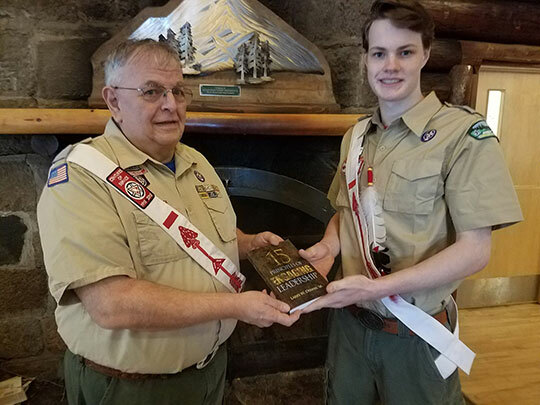 Vice President, DSU Peterbilt & GMC Inc.
15 Principles of Engaging Leadership aligns with Boy Scouts values and is used to support the leadership development of Eagle Scouts. The Language of Leadership - - For leaders who want to successfully communicate their ideas; provides a new definition of "communication". You are given very specific guidelines for all communication - selling ideas, running meetings, listening, acknowledgement, asking questions, on-the-job training, coaching, correcting, and more. Over 100 real life examples from leaders like you make the concepts easy to understand and apply. Communication is the core skill required to successfully maximize the value of all resources. The Language of Leadership provides you with specific insights on how to improve your communication and provide the feedback that ensures improved performance and morale. BY LARRY W. DENNIS, SR.
"I read the "15 Leadership Principles and Ronald Reagan" from cover to cover. On page 16 I pulled out my yellow highlighter and placed a red tab on the page because I wanted to make sure I could turn to that page later at a glance. Now that I'm finished, my highlighter is dry and 17 tabs mark pages I can locate at a moment's notice. The book has been floating around my desk for the past six months as I can't put in on a shelf yet." Thinking about what President Reagan meant to me, to our country, and to the world in which we live led me to write this book. Based on over three decades of training managers to be empowering leaders, I have written about maximizing your potential and leading others to help them maximize their potential. Certainly, Ronald Reagan is a quintessential example of both. The challenge in writing this book was not finding examples of Reagan's empowering leadership style; it was deciding which of the vast examples to include. The world is different because of Ronald Reagan. President Reagan was an empowering leader with the vision and courage to change the world. At the time of his inauguration in 1981, nearly 80% of the world's population lived under Communist regimes. The free nations were not sure there was anything they could do to stop the expansion of Communism. Some argued there was not even any reason why Communism should be stopped. Domestically, America faced double-digit inflation and interest rates. Unemployment was rising. Economic growth was stagnant. Today, twenty-five years later, there is more freedom, more liberty, than ever before in human history, and the United States of America is a model for economic growth. Ronald Reagan believed that anyone - everyone - can change their world. Everyone can be an empowering leader. What it takes is the belief that people can affect their own destinies and those of their team and organization. As we explore how Reagan influenced the world, we can learn from his example and see how we, too, can influence our world. Let Ronald Reagan show you how you can be an empowering leader. They arrived in time – before the end of term. John said it was very exciting to get them. Soon after receiving them, he was in his CO's office and noticed that the Reagan book was one of 3 books on his desk. 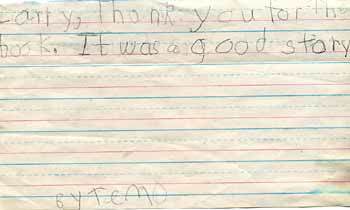 Some of the young Marines wrote me thank-you notes. One said he had just finished reading it – even though he's in the middle of exams. He said "Thank you for taking an interest in my professional development." What a rewarding thing this was for me. I've been so happy, reading good news from Iraq lately. It's great when I can to something to help. From humble beginnings as a newspaper delivery boy, to chief executive officer of his own company, Larry Dennis has come a long way. But his journey to the top comes as little surprise to the 67-year-old Michigan native. From the start, he says, he has always been fixated on success and doing what it takes to achieve it. "I was born with a ton of determination," Dennis said. "I've always tended toward confidence, and when you have that you can overcome many difficulties." That mindset has allowed him to not only establish his company, Turbo Leadership Systems, as an internationally renowned provider of leadership training, it also let to the second career as an author. Now a self-made multi-millionaire, Dennis lives and works at his expansive, five-and-a-half acre estate on the Willamette Rive five miles west of Wilsonville. He chalfs up much of his present success to experience gained at age 12 running his own paper route, and is a fierce advocate of the benefits of simple hard work and effective communication. Finding himself responsible for buying and delivering newspapers, as well as collecting subscriptions and money, hew was in charge of every step of running his own business. "I feel really sorry for kids who don't have that business experience," he said. Dennis was born in 1939 at the end of the Great Depression. He said the experience had a profound effect on many people of his generation who saw its lingering effects. His father was a carpenter part of a family construction business, while his mother was a nursing assistant. The family struggled financially at times, but the Dennis clan was never one to sit around and complain. Instead, a young Larry went to work at a hardware store at 16, where he met a salesman who also made a lasting impression on his adolescent mind. "He drove a Cadillac and he wore a fancy hat," Dennis recalls. "That impressed me." He went on to attend Eastern Michigan University, graduating with a degree in business, and eventually took a job with the Ralph Nichols Corporation, a Detroit firm specializing in sales and motivational training. After 10 years with the company, he struck out on his own. In 1976, Dennis and his wife, Donna Lee, whom he married in 1962, moved to Oregon with their three young sons, Larry Jr., Barry and Loren. On the West Coast, he said, he found a much different culture and business environment than he left behind in the Midwest. "I wanted to come out here before that," he chuckled, "I didn't reaslize I was coming to the Left Coast. But I liked the weather, and I was pretty determined not to get to a place where it was too warm." found the mid-70's political environment in Oregon tedious and economically counterproductive. He also saw that the laid-back nature of Pacific Northwest living carried over to the business community. To him, that wasn't necessarily a good thing. "This is a backwater here," he said, describing Oregon's see-saw economy of recent decades. "It's got it strengths, but from a business standpoint it's not a friendly business environment." It was good enough, however, for Dennis to launch Turbo Leadership Systems in 1985. Using training methods honed by the legendary Dale Carnegie, Dennis built the company from the ground up. He developed his own unique method of leadership training along the way, taking pieces of what he learned over the years and throwing them all together to create his own winning formula. "We don't embrace any of the traditional methods of instruction," he said. "Our fundamentals have stayed the same. We are in the behavior changing business." Ronald Reagan was known as the Great Communication. But Reagan also left behind a legacy of leadership, which many conservatives are currently endeavoring to carry on into the 21st century. And that's where Dennis comes in with the latest of his eight boos, "15 Leadership Principles and Ronald Reagan." Released two months ago, the book seeks to show how Reagan employed solid leadership skills commonly used in the corporate world. "It's about his style, his methods and his approach," Dennis said. The book fits solidly into Dennis' political philosophy, honed by a childhood spent supporting Barry Goldwater. Dennis even likes to joke that his first date with his wife, Donna Lee, was attending a rally in the early 1960's. If it hadn't been for his oldest son, Barry, however, Dennis said he never have gotten started as an author. "He really had to beat me up to get me to write it," Dennis said with a chuckle, recounting how his son had pestered him for some time before he ever tried his hand at authorship. When he did start, however, the idea for a book quickly formed. It would be centered around the area Dennis knew best: sales. It ultimately took him three years, but once "Repeated Business: Six Steps to Superior Customer Service" was published in 1992, Dennis found that writing was something he enjoyed. Eight more books, including his latest, have followed. A ninth is on the way. "Once I got into it, I realized it was something I could have done before" he said. Motorcycle Meditations is being excerpted in the June, July and August issues of V-Twin magazine. In the June issue, it's a 2-page spread, and we are really excited about it. According to Larry W. Dennis, president of Turbo Leadership Systems and passionate motorcyclists, "There lives inside each of us a genius, a power, a capacity-an untapped potential. This possibility for being and becoming is seen in the shadows of our past achievements- the mist of dreams and aspirations. We tap our potential by gaining confidence from our achievements, accepting responsibility for our present and committing to our goals." 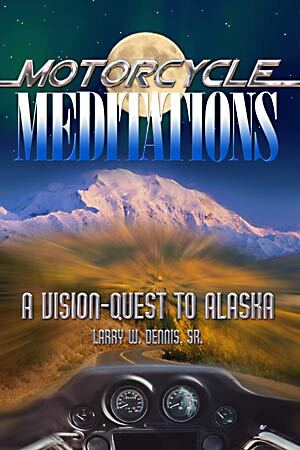 The process of taking touring trips on his motorcycle has been a spiritual adventure that Larry has chronicled in his book "Motorcycle Meditations, A Vision Quest to Alaska". The book captures the heart and soul of motorcycling as well as the Zen of the riding experience. Why do so many riders equate riding a motorcycle to the feeling of flying or the convention of freedom? Larry spells it all out for us in a combination of subtle prose, adding thoughtful quotes from brave minds to embellish his mythic travels on two wheels. It is no wonder that I first met this motorized meditator as a fellow celebrant of Dr. Jean Houston's Mystery School in Wilsonville, Oregon. Here, Mr. Dennis takes us on a road trip of the mind in the great Mystery School traditions. "Motorcycle Meditations" is a thoroughly enjoyable trip through what goes on inside and outside the helmet of a motorcyclist as he dares to travel far beyond convention on roads far less traveled. I was proud to publish excerpts of Larry's book in the pages of V-Twin magazine (June, July, and August 2005 issues). Ride free, Larry. 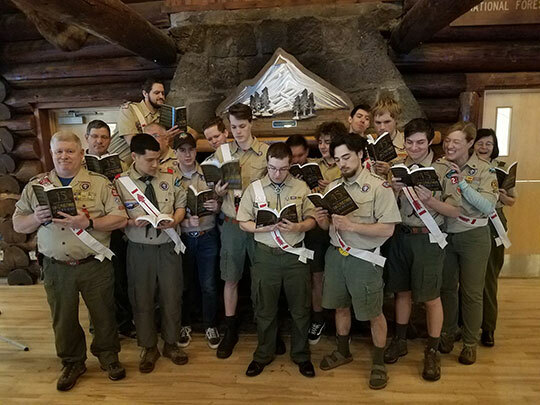 I just wrapped up reading the last of your book on your trip to Alaska and now wondering where the next one will take you. I enjoyed the book immensely and wanted to offer my congratulations on a job well done. I do have a couple of managers I am considering for your leadership lab program. Drop a note as to the scheduling of same so I can begin to plan accordingly. I really enjoyed your book! You're Zig Ziglar, Dale Carnegie, and Napolean Hill all rolled into one. Not to mention adequate references to Emerson, Thoreau, and others! Quite a trip you made.. literally and figuratively. I need to take exception to your references to airplanes though.... I need to take you up for a ride some time. I'm passing your book and the other information along to Mark Conan for his enjoyment and review. I received Larry's new book on Friday and read half of it that evening. I read the other half Sunday night, staying up till 11:00. What insight! I have only done one day trip like that on a motorcycle, riding around Mt. Rainier in August 1978. It truly was a religious experience, a chance to get down into my inner being and find new direction and enthusiasm. I noticed several quotes from Jonathan Living Seagull, which is a very freeing book, also. I trust Larry will receive good feedback on this. I ride my Triumph Bonneville T100 nearly every day to work and back, 62 miles total. I am only able to enjoy brief moments like Larry experienced for hours while on the road. What a great story! Thank you for your book – a most enjoyable read that is full of insight. It had been about 40 years since I owned a bike (Honda 90 Trail bike) and I some of my staff thinks I walked off the edge for purchasing a bike. My wife's mother died two years ago, my sister died at 54 two months later – then my wife's aunt died. All with many unfulfilled dreams – not me if I can make it happen. I have always wanted to own a larger bike so began exploring options in July 2004 – and after the initial sticker shock I have no regrets for settling on the Harley. I've put on 6,500 miles in the past year – and plan many more. I told my grandson that I plan to attend his high school graduation in ten years on the bike (I'll be 68 then). Thanks again – I'll pass along the book and "Keep the Bright Side Up". I just finished the book last week. I read it slow, so that things could sink in. I would like to say that it is an amazing book. Between your writing and the quotes you choseindeed very inspiring. It actually helped get me out of a funk I had been in for several weeks prior. Thank you. So conversational and easy to read…and thought provoking. ALL THE BEST WITH IT! Larry W. Dennis is - as the back of his books read - "the energetic founder of Turbo Leadership Systems" and the author of several motivational business books such as "Repeat Business" and "Empowering Leadership." Now chalk up a motivational kids' book to the lineup. Thanks to a session of meditation - "I try something new every year, that year it was mediation," Dennis says - the motivating author became motivated to tell a story aimed at kids. A story about positive and healthy attitudes. And "The Great Baseball Cap" was born. "I just kept visualizing this baseball cap" during a mediation session, Dennis says. "That night I grabbed a yellow legal pad and basically wrote the entire story." The story centers around a great baseball player and the baseball cap he always wore and the good luck - real or perceived - that the cap seemed to bring to others who cam into contact with it. Dennis traveled to the annual baseball Winder Meetings last year to help promote Turbo Leadership Systems, but while there he also was able to promote "The Great Baseball Cap." "We had a booth there to just promote the company," Dennis says. "At the time, the book has been out less than a month. I didn't know what to expect. But I would read a page to someone [at the meetings] and then watch their face. I started to realize we had the right thing here." Dennis says several major league teams have expressed an interest in using the book as a tie-in with the kids' promotions in the coming season. The 31-page book is published by Rising Tide Publishing of Newberg, Oregon. More information may be obtained via e-mail at turbo@turbols.com. 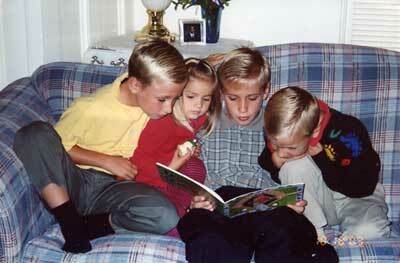 Todd, Katie, Mark & Sammy reading "The Great Baseball Cap"
Larry, Thank you for the book. It was a good story. I liked the Book you sent us. Thank you. Thank You! What a great story and message. This will be one to pass on to generations. Your book is a winner. It will help every young reader become a winner and build resolute self-confidence and the ability to feel good about themselves and achieve. That's my endorsement. Thanks for your book. I read it immediately & loved the message. Every youngster needs to hear it. Next you'll be marketing "I am a Winner" baseball hats to go with it. Hope you & Donna Lee are doing super— & that you enjoy the thoughts in my book. If you come to Bend— you gotta call. Thank you for the "The Great Baseball Cap" book. I have read it several times already. I am sure children of all ages will treasure this book like me. Thank you so much - we have enjoyed it too! Thank you for sending me the book you wrote. It is great! Thanks so much for the great book that you sent us for my son. He loves to read and he loves baseball so they will be a big hit with him. I love the positive message that you send in this book. I truly believe that we all need to take very active roles in leading, modeling and teaching our kids and books like this help to reinforce the message and set the tone. Thanks so much! Have a great holiday season! Thank you for your generous donation of copies of "The Great Baseball Cap" for our programs. As you know a positive self image is very important to children, especially those who have difficult situations due to abuse or neglect. Our programs at Volunteers of America Oregon work to build better relationship and give people the tools to help themselves. Your thoughtfulness in reaching out especially to young children to give them a better start is so appreciated. Making Moments Matter provides powerful time management tools to help you become more organized and productive in your professional and personal lives. 89 Tools For Taking Charge of Your Time. We recently received information from Mr. Larry Dennis of Turbo Management Systems. Many of you are familiar with Larry due to his presentation at our franchise conference several years ago. He is the author of several books, one of which is Repeat Business. Repeat Business is a service person's Bible. We have found it very helpful in operating our routes in a way that ensures we keep our customers buying throughout the years. Larry went on to write some other fantastic books which have been available to the franchises for a couple of years, such as Empowering Leadership, Turbocharge Yourself, and In Formation. Larry, a former Dale Carnegie instructor, has always had a special gift for helping others maximize their efforts to succeed in their business and personal life. Larry's new book is called Making Moments Matter - 89 Tools for Taking Charge of Your Time. Walter Heinle and Doug McCauley have read the new book and are excited about the contents. It is very easy to read with great points on organizing yourself and getting the most of your time. Making Moments Matter Provides powerful time management tools to help you become more organized and productive in your professional and personal lives. Eighty-nine time management tools provide insight into how to make the most of every precious minute of every day. Making Moments Matter gave me the tools to make every second count so that I could move my life closer to what I want it to be. I've learned to work with what I can control, to persevere with what I can't control, and to seek the best possible results in the most efficient way possible. Thanks, Larry Dennis, for making it possible for my dream to be fulfilled. Making Moments Matter simplified my personal life and my busy work day. By applying the tips that Larry presents, I have achieved greater time management and obtain better results from my precious, priceless moments. By being flexible and willing to change, I am strategic and inventive with all my daily routines. Often I find myself frantically busy all day long, pecking at one task after another. By the end of the day, I would have nothing substantial accomplished and ver little to show for my efforts. Making Moments Matter helped me identify and prioritize what is important. Stay on task, and, most importantly, have a sense of accomplishment by the end of the day. As Larry says, it is not about "time management", it's about making the most of your life. Time is the only true absolute. How we use it is what sets us apart in both business and life. Making Moments Matter has helped me make better use of my time, absolutely. In your personal and professional life, there are few lessons that are more important than those that help you control the resource of time. The skills and awareness that you can learn from Making Moments Matter will make the difference between "never having enough time" and having a systematic approach to allocating your time to accomplish what is important to you, your family and your career. This can be the greatest year of your life. You can experience a sense of self-direction, a sense of being in the driver's seat. How to Turbo Charge You shows you how to apply a 6 Steps to Tap Your True Potential and leverage off of your successes to make the rest of your life one of steady, upward progression. This can be the greatest year of your life. You can experience a sense of self-direction, a sense of being in the driver's seat. How to Turbo-Charge You shows you how to apply a 6-step process to maximize your full potential and leverage off of your successes to make the rest of your life one of steady, upward progression. Larry W. Dennis, a dynamic motivational speaker, author and trainer empowers people to achieve, "world class" performance resulting in the highest possible quality in their work and personal lives. Since 1962, he has created the opportunity for over 110,000 people across the country and in five foreign countries to build more meaning and purpose into their lives. Larry is also author of Empowering Leadership and Repeat Business. Larry has created an outline for the road to success both personally and professionally. A must read for all employers and employees. It's the best self-help book we've read in years - he simplifies everything and then takes you through the steps. An effective, empowering way we can find the hero that exists inside all of us. This is an essential book for anyone serious about effective change. I love the real life experiences that you shared showing common people breaking through fear and self-doubt to rise above life challenges. Palmer, Groth & Pietka, Inc.
My life has been in turmoil and indecision for over a year. Reading your book helped me set goals and GO FOR IT! It motivated me to go back to school and follow a dream I've had for years." When a company develops a routing to accomplish continuous improvement, they seldom deal with the personal development issues. This book not only provides a guide, but also continuous flow of examples. An inspiration, a usable guide and a fun-to-read study on a course in self development to continuos improvement. The principles you outline in Repeat Business are truly the basis of what you taught to over 1,000 Fred Meyer top management in the 13-week seminars. It is the guide to building a solid customer base.  Bob Ulrich, Marketing Director, Dial One Northwest, Inc.
What a great book! It is a must for all employee manuals in companies of all sizes. You are right, customers are less and less tolerant of companies that don't show a caring attitude. It's so enjoyable and easy to read…a cross between Garrison Keillor and Paul Harvey… But most of all it got me excited about what we can do to create repeat business. I want to make sure every employee in my office has a copy. The Leaders Success Book for the 21st Century. Empowering Leadership tells you in straightforward, plain language and over 270 colorful anecdotes how to develop leadership that empowers others to peak performance. Empowering Leadership tells you in straightforward, plain language and over 270 colorful anecdotes how to develop leadership that empowers others to peak performance. Written by the author of Repeat Business who has trained more than 110,000 business leaders in the United States, Africa, Italy, Canada, and Great Britain, Empowering Leadership has been hailed the business success book for the Nineties. The insight you present in, Empowering Leadership has given our management team the clear and precise ability to develop their leadership skills. Empowering Leadership taught me that I can make a positive change in the business, and personal lives of my team. The fifteen principles of leadership in your book are like spark plugs of power that give readers the boost they need to take action. Page after page the wisdom of your book provides valuable tools I apply daily to raise our team to higher levels of accomplishment. How To Gain The 71% Advantage! InFormation equips your team with the same advantage a flock of geese takes for granted. By following the tested guidelines outlined in this authentic resource book, your organization will fly farther, faster, and with no additional effort, keeping you out in front. Yesterday I started to read your book. I will be really honest and tell you that in the back of my mind, I told myself, "Yeah, another management book. How many of these am I going to read and get only a little out of?" I read the introduction and the first chapter, and I'm not sure why, but my body started to tingle and I got excited. I asked myself, "What is going on here?" (still not sure), so I started to read it over. As I did, I got the same reaction. I asked myself if someone was telling me something. I took the book home and asked my wife of 26 years to read the first part, the same part I had read. Her comment to me was, "WOW! We should read this together, we both need it," so we agreed to do just that. Increase your team's performance by 71% and do it NOW! InFormation equips your team with the same advantage a flock of geese takes for granted. By following the tested guidelines outlined in this authentic resource book, your organization will fly farther, faster, and with no additional effort, keeping you out in front. Most companies share a commitment to quality. In Formation shows you how to achieve quality through leadership. By following the techniques outlined in this book, you will peak your teams level of performance. Larry W. Dennis Sr. takes a very practical approach using real-life examples. You will find the guidelines easy to follow and implement. The principles Larry W. Dennis Sr. teaches in In Formation have worked for us. For years our central distribution center delivered material once a week to our 60-branch network. Now, our warehouse team leaders have improved our materials management process to deliver every day to our branches with no increase in costs. If you want to see dramatic breakthrough in improvement, read and study In Formation. In just the last 18 month, after a 10-week program centered around the In Formation principles, we increased our production nearly 100% with half the labor costs. We have reduced our entire company's labor costs by 12% while sustaining similar increases in sales. We now measure, track and analyze our performance to make our jobs easier and more profitable. In Formation is an excellent tool for reaching success in today's fast-changing, increasingly competitive business environment. Over the past two years our business has been energized by learning and applying the principles and strategies presented in In Formation. As a job-shop surface finisher, we are facing demands for shorter cycle times and higher levels of quality. Centering around 'teams,' employees are now setting goals, measuring against them, celebrating their achievements and solving problems. As Larry's principles are applied in your business, the results are immediate and remarkably self-sustaining. As a dynamic motivational speaker, columnist, best selling author and trainer, Larry empowers teams to achieve "world class" performance.